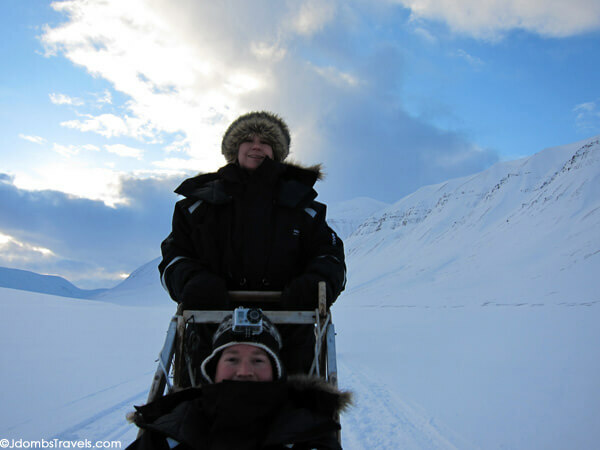 If our snowmobile safari across Svalbard didn’t make us feel like Arctic explorers, learning to mush with a team of huskies across Svalbard’s glaciers and frozen fjords sure did! 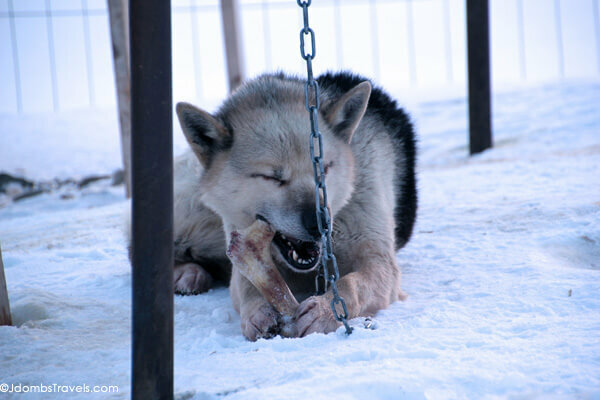 We hear the 50 or so huskies that live at the Svalbard Husky dog yard before we even pile out of the Jeeps. I think the dogs are even more excited than we are to begin our dog sledding adventure in Svalbard. We’ve been dog sledding in other places and in all honesty, those other experiences have felt very “touristy”. We’d arrive to have the dog teams already harnessed and ready to go. We’d climb into the sled and be off. But not at Svalbard Husky. This experience was different; owner Robert Nilsen knows how important the bond with the dogs is to truly being in control of your sled. We go around the dog yard meeting each of the dogs and plying them with pats and affection; we get a few sneak kisses in return. 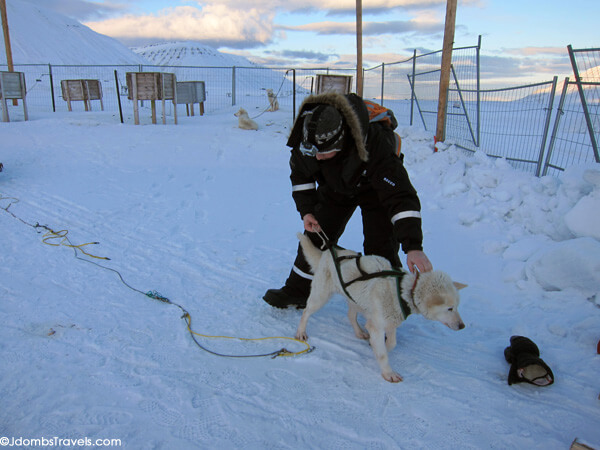 After a lesson on the mechanics of the sled and perhaps the most important thing to remember – never let go of the sled – we get a lesson on how to properly harness our dogs and get them into position. It definitely a two-person job to assemble the team as the dogs excitedly hop back and forth over one another. A board lists the seven dog teams and their positions. Whether the dogs go on the left or right isn’t important; the dogs just excitedly hop back and forth over one another. But their position in line is extremely important because each dog has a very specific job to do. Our lead dog is Frøya and she’s queen of the dog yard. Robert groups his dogs by litter and Frøya is from what he refers to as the Norse Gods litter. She is not only one of Robert’s very best dogs, she is also mother to many of the other dogs in the yard. Tim easily slides on Frøya’s harness and hooks in her neckline and towline. I take hold of the line and Frøya waits patiently with me while Tim goes to retrieve Charlie. 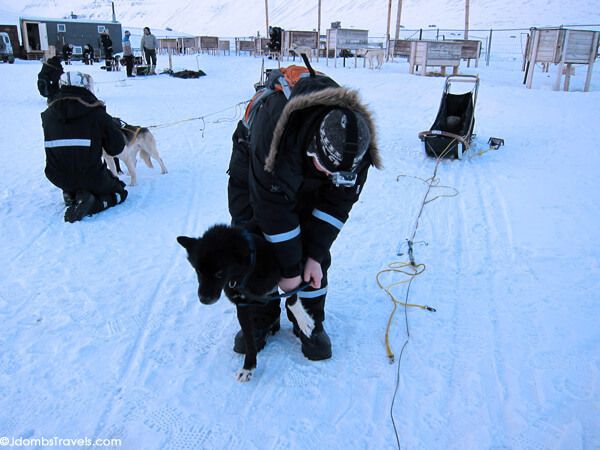 One by one, Tim harnesses the remaining four dogs for our team and hooks them in to their necklines and towlines. It’s getting harder and harder for me to halt the team; they’re barking and hopping excitedly, anxiously ready to run. 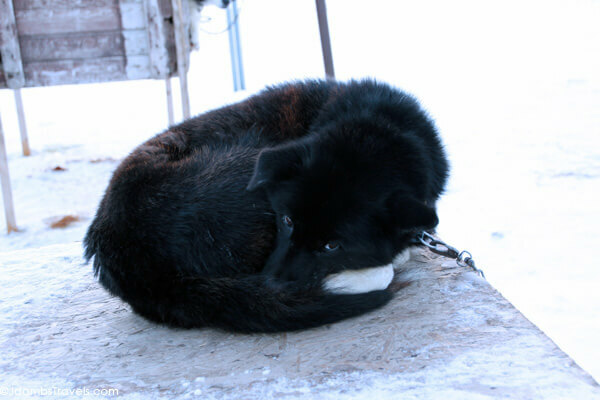 As the teams all finish harnessing their dogs, I climb into the sled and clutch the snow hook to my chest as instructed. Our guide swings a high-powered rifle over her shoulder, releases her brake, and the barking stops as the dogs lurch forward. “Let’s go!”, she calls over her shoulder. We were supposed to be next in line behind the guide, but another team a little too anxious to run rushes past us. Tim easily controls our team by standing on the break pad and let’s them pass before easing off the break and letting our own team lurch us forward. 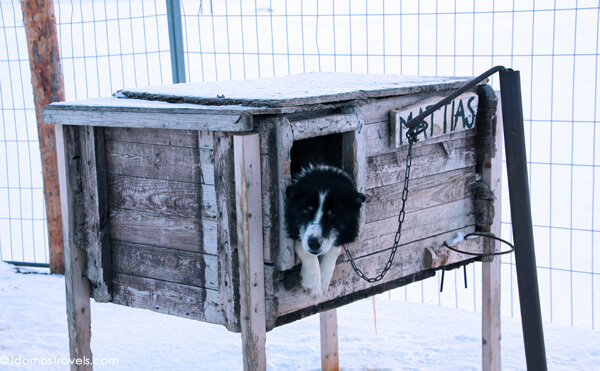 We head out across the snowmobile free zone of Bolterdalen in 6 teams, 36 dogs in all. It’s nearly silent; the only sound is happy husky paws crunching the snow beneath them. Everything is tinted shades of blue as the mountains loom all around us and we glide past Svalbard reindeer digging in the icecap for some lichen. About halfway through, we swap positions and it’s my turn to drive the sled. I find a comfortable position on the footboards, turning my heels inward to press on the break pad as needed. 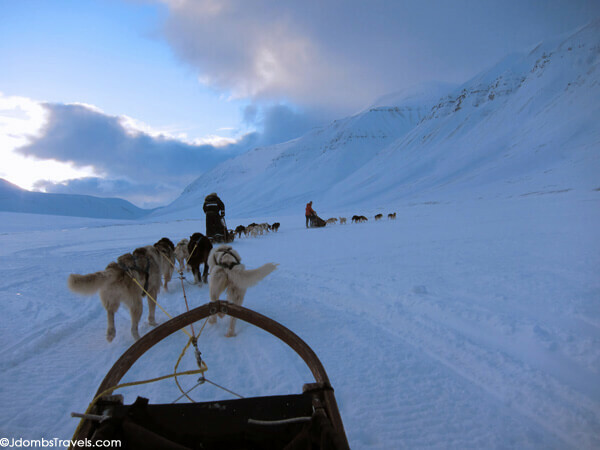 I smile ear to ear as I lean into the turns and feel the power of the dogs pulling us through the Arctic wilderness. Back at the dog yard, the dogs aren’t even tired. They’re hopping excitedly as if to say “Let’s go again!” But that’s all for today and I again hold the towline as Tim methodically unhooks and unharnesses the dogs one-by-one, putting them each back in their individual homes. With all 36 dogs back where they belong, we all pitch in to feed them and deliver bowls of hot food to each dog. It only takes minutes for them to gobble up the food and we collect the bowls back up and say goodbye to our new husky friends. All is quiet as the dogs settle in for a nap while we climb back into the Jeeps. 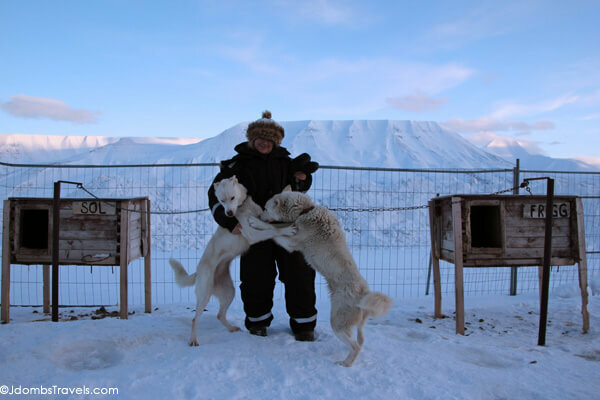 We absolutely loved our experience with Svalbard Husky because we didn’t just go for a dog sled ride; we were put to work for our dog sledding adventure in Svalbard and truly felt we had bonded with the dogs through the whole experience. 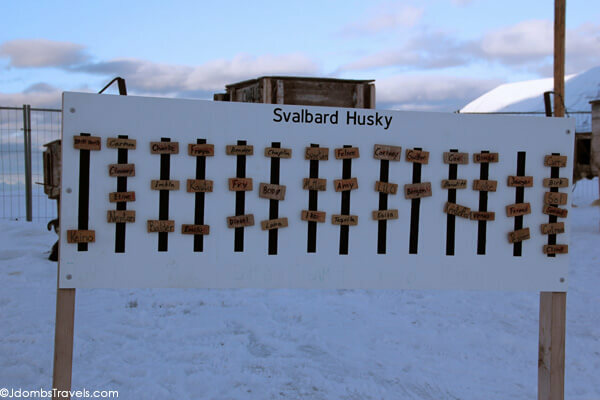 Winter dog sledding adventures with Svalbard Husky run December 1 – May 20 and are 1190 NOK per adult and 890 NOK for children 8 – 14 years of age. 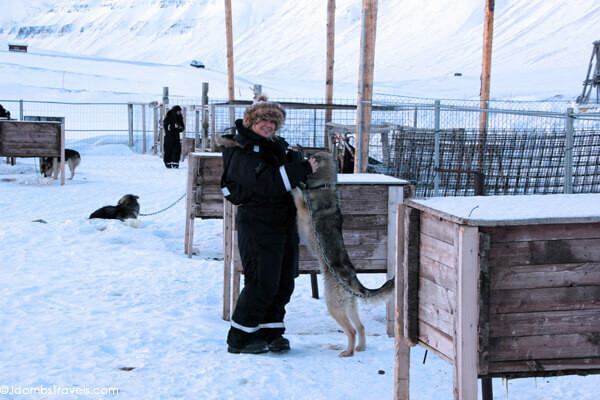 Svalbard Husky provides winter snow suits, gloves, and boots. Wear wool socks, a hat, and thermals for under the snow suit. Guides carry all protective equipment in case of polar bear encounters. Our trip to Svalbard was provided by Northern Norway and Visit Norway USA in order to bring you this story. However, Luxe Adventure Traveler maintains full editorial control of the content published on this site. As always, all thoughts, opinions, and enthusiasm for travel are entirely our own. I was INSTANTLY attracted to the huskies. Especially little Mattias in the last photo. =) Looks like it was a very awesome adventure. The huskies are so friendly and social. They love to run and we truly had a fantastic experience with them. I love the scenery you encountered on your dog sled trip. I’ve done it once here in the Canadian Rockies -touristy but fun. Would love to do an overnight trip. We’d love to do an overnight trip also, Leigh. There’s actually a 3-day dog sled trip to an Inuit village in Greenland we’re highly interested in! Dream come true! I really want to go to Svalbard one day 🙂 Great pics! You make it look so fun!! Thanks, Liz! We love dogs and these ones were particularly great to sled with. The dogs are so social, but their true love is to run with the sled. You can just see how much they love it! I really do think that spending the time with the dogs while getting them ready creates a bond to help you better command the sled. From other experiences where everything is ready and you just go, the dogs pretty much do their own thing and just follow the sled in front. This experience just felt authentic. 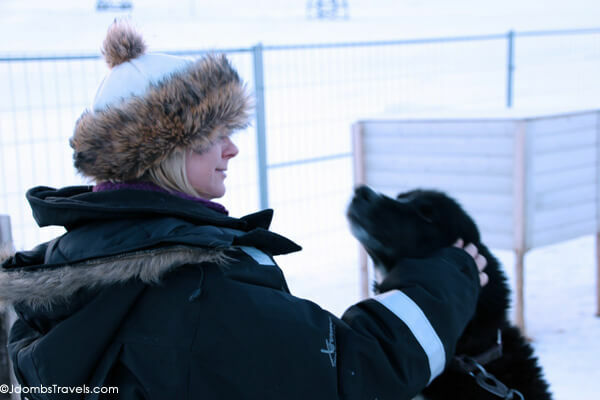 We loved our dog sledding experience – so much fun! It is a lot of fun! We really want to do a couple day expedition by dog sled. Now that would be amazing! Those pups are so cute! I love that they give you a chance to bond with the dogs first. I've never been dog sledding. 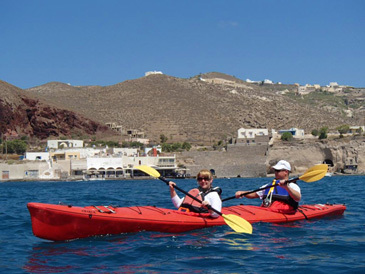 It's definitely something I want to do soon, but being in extreme cold is not my thing! I lived in Alaska for a couple of years, where as everyone knows, dogsledding is big. And as you mentioned, the dogs really seem to love running. I only had one dogsledding opportunity and had a little team of 4 for the brief excursion, but there was nothing like being out in the brisk air with just the sound of the sled whisking over the snow. I wouldn’t mind doing an extended trip in Denali Park some day. Keep up your adventures! Planning a serendipitous trip to Oslo at the end of February thanks to the air force! This looks absolutely AMAZING! Definitely worth the weekend jaunt to Svalbard!! Do you have any more suggestions of any kind for Svalbard or Oslo? 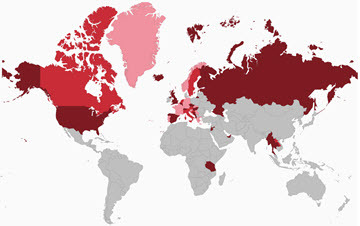 As for Svalbard, it’s expensive and a long way to go even from Oslo for just a weekend. This dog sledding tour was at least half a day. We also really loved the snowmobile safari, which is a full and long day. You can read about that here: https://luxeadventuretraveler.com/snowmobile-safari-across-svalbard/. You’ll stay in Longyearbyen as your base, which is basically the only settlement in Svalbard. We recommend the Svalbard Hotel http://www.booking.com/hotel/no/svalbard.html?aid=1143113. It’s right in the center where you can walk to restaurants without worrying that you need a guard or a rifle because of polar bears. Splurge on a meal at Huset Restaurant, the only fine dining restaurant at the top of the world. The burgers are excellent at Svalbar Pub. Coal Miner’s also is known for the best barbecue in town. It’s a half day of travel from Oslo to Longyearbyen, so if you went from Friday to Sunday you will really only have Saturday to schedule any activities. Also, not sure when your trip is but also realize that the sun won’t return to Svalbard until March 8. They’re still experiencing their period of Polar Night, which is 24 hours of darkness. All that said, Svalbard is a really special place and if you have the means to visit, it’s someplace the majority of people will never see in their lifetime.